Today's VETgirl online veterinary continuing education blog is by Dr. Matt Brunke, DVM, CCRP, CVPP, CVA on the "Top Ten Misconceptions Veterinarians Make About Rehabilitation." More and more clients EXPECT rehab for their pets (that they consider members of the family) just as they expect it for themselves. Additionally, since when is making something the best it can be EXTRA? Strive for the ideal healing, and getting those pets back to full function. Add rehab to all your surgical estimates. You know that old exam room that is full of junk? That can be a rehab space. Yes, space is a premium in veterinary medicine, but fundamental rehab can be done with an exam room and a hallway with good traction. How do I know this? Personal experience, I have done this at two of my practices! While lasers and underwater treadmills are excellent medical devices (with research to back up their use, therefore not “toys”), proper rehab starts with a sharp mind and many things you already have in the office. Look around, do you have ice packs, towels, some agility equipment from that dog trainer you used to employ? How about that treadmill you got for the staff to exercise, but nobody uses it? Then you have rehab equipment already. I could disprove this in so many ways, it could be its own top ten list. Bottom line, peer-reviewed research shows excellent results of animals going through rehabilitation. Our clients have higher expectations for their pets (working/service dogs, agility, fly ball, lure-coursing) than ever before. If you don’t provide what they are looking for, they WILL find it (and other services) elsewhere. We are all human, none of us are perfect, and even if your surgical record is flawless, we all know clients can undo the work we did. Do you think that soccer mom with 4 kids has the time for leash walks on the TPLO? How about the working couple who both do 12 hour shifts, and the Yorkie with the FHO is confined to a crate 14 hours a day? Would you expect those patients to be walking without professional help? Good communication is critical to safe, effective rehabilitation. If your local boarded surgeon (or neurosurgeon), doesn’t offer rehab at their practices, guess what, they may be looking for someone to help them! More specialists are training at facilities with rehab already incorporated into them, and will be needing your help if their new practice doesn’t have it. They have their part in fixing Fluffy, now it’s up to you to finish the job. Remember, setting safe, practical guidelines between the rehab practice and the surgeon is essential. We all want the best outcomes for our patients. True, cats can be stubborn, but cats LOVE rehab! 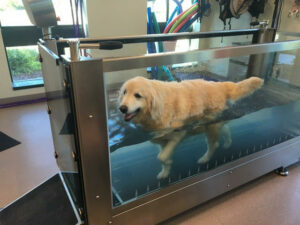 While not all will walk on the underwater treadmill, they can benefit from photobiomodulation (laser therapy), massage, acupuncture/acupressure. A laser pointer or feather toy can help a cat actively stretch, or perform range of motion exercises. With the limitations on cats taking medications (either from disease, or from the “joys” of getting meds into a cat), rehab is a great option to keep our friendly felines feeling great! Anything worth doing is worth doing right! Yes, it can take 12 months to be certified in rehabilitation. That commitment is what you should want from your staff, so that they “do no harm” and know what they are doing to safely and effectively help patients. The training facilities have recognized the time commitment, and now offer classes online, as well on rehab specific continuing education to keep your skills sharp. Pending on your state practice acts, you may have future staff right under your nose. In some states, physical therapists can practice on animals with veterinarian supervision. Here are trained professionals that have a passion (just like us) for making things better. In other states, licensed veterinary technicians are incredible assets in managing patients and delivering treatments. Talk to you staff during annual reviews, you may be surprised what you have in your hospital already. You should have a point person (a veterinarian) and this may not be you. That’s ok, it may be the associate looking to add a new skill, or the new grad who took rehab as part of their senior rotations. Ask, and you shall receive. Rehabilitation is not pigeon-holed into just orthopedic surgery. I equate it to the Statue of Liberty “Give me your tired, your limping, your arthritic, neurologic, young and old, yearning to run free!” More of your patients will benefit from rehab than you can think of. Incorporating a rehab department slowly, safely and efficiently into your practice will not only grow your practice, it will grow your bottom line. 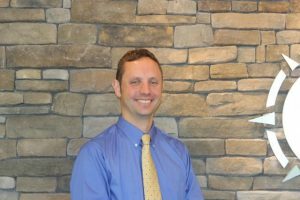 Dr. Brunke practices at Veterinary Orthopedics and Sports Medicine Group in Maryland. He teaches nationally and internationally on rehabilitation, sports medicine and pain management. You can check out his blog at drbrunke.wordpress.com or email him at drmattbrunke@gmail.com. Great insight! As a manufacturer of underwater treadmills, we constantly hear rehabilitation success stories. Many veterinarians have mentioned that they routinely add rehab visits to surgery estimates to ensure the success of the surgery. If the pet owner doesn’t follow the written protocol, they may consider the surgery unsuccessful. If they bring their pet to rehab, the pet will recover quicker, the surgery will be considered a success, and the practice generates additional revenue. We also commonly hear that surgery may not be necessary and complete recovery from some injuries can be accomplished with proper rehab. And this often leads to on-going visits, pleased customers and additional revenue. Thank you for this article. As a CCRT I had a harder time convincing other veterinarians about the value and benefits of rehab than I did my clients!